Color Challenge for this week! This week's colors were Pacific Point, Old Olive, and Tangerine Tango. 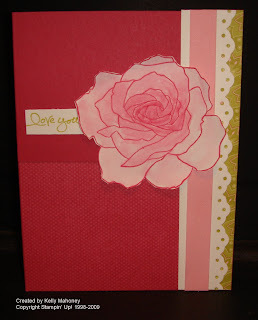 I decided to use Beate's Sketch challenge for this card. So, once I had the sketch and the colors the only thing left was to choose the stamps! I chose Baroque Motifs and Dreams Du Jour. I stamped the Old Olive card with the big swirl stamp from Baroque Motifs in Old Olive ink. Then, I cut a strip of Pacific Point and ran it through my Big Shot with the Texturz plates. I used my Pacific Point pad and lightly brushed the pad over the raised dots to make them stand out. For the middle part, I cut a strip of Tangerine Tango and punched it with the Eyelet Border Punch. On a pice of Whisper White, I stamped the Dreams image from Dreams Du Jour in Basic Black ink. I watercolored it with my ink pads and Aqua Painter. I stuck to the week's colors for the watercoloring as well. Finally, I stamped the small butterfly, also from Dreams Du Jour, on a scrap of Whisper White and watercolored and cut them out. Then, I added them to my card with glue dots, just under the bodies, so that I could pop up the wings. Last week's color challenge was to use: Pacific Point, Bashful Blue, More Mustard and Old Olive. I found these little paper bags that I got at a craft store. They are 3 1/4" x 6 1/2". Anyway, I got to thinking about them and decided to make a little paper bag book. For the cover, I used Pacific Point layered with a piece of Bashful Blue dsp. Next I stamped the Rock Star stamp on Whisper White CS in both Pacific Point and Old Olive. I punched it out with my large star punch. For the first set of pages, I used More Mustard DSP. I also used some of the chipboard from the On Board So Tweet. I colored the flower with Bashful Blue ink. The stem and leaves were colored with Old Olive. I added a Star brad for the center of the flower. Next, I made these pages with Pacific Point CS. I added a strip of Bashful Blue or the right that i wrapped with striped Pacific Point ribbon. I added 3 stars that I punched out of More Mustard and Old Olive cs with the small star punch. In the middle, I made these nice simple pages from Old Olive CS. I layered the left side with Whisper White CS. Both pages were stamped with the vine stamp, from the Fresh Cuts set, in Old Olive ink. These pages are also pretty simple. They are Bashful Blue CS layered with a strip of Bashful Blue DSP. Next I added 2 flower brads - one on each page. Finally, I wheeled the last pages with the Star wheel on Pacific Point CS in Pacific Point ink. I tied a piece of Bashful Blue Grosgrain ribbon around one side and that was it! I still need to make the inserts for the pockets and then I will add some pictures of my two little rockstars! I hope you enjoyed this! It was a fun project to make. However, when I made it, I was with my sister, so I am pretty sure that it was the company that made the project even more fun! Stamping with friends is always fun! 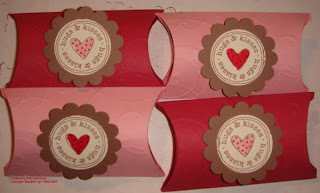 Here are a few Valentine's that I made using the Love you Much stamp set and Candy Lane DSP. This first one uses the Gift Card Holders. Don't forget to stamp the envelope too! This next one was kind of an accident. The Big bird is printed on one fo the sheets of DSP. It is actually 2 birds like the stamp in the set. Anyway, when I was making another project, I accidentally cut off the other bird. So I figured, I may as well use this one on a card. I cut it out so that it would layer nicely on a 3x6 Chocolate chip card. I then added another piece of DSP on top. By stamping the Hugs and Kisses stamp on a few different colors of CS, I was able to punch it out and create the embellishment. This one was an idea from the Stampin' Up! demo area of the website. This was a card sent in by another Demo. I loved it! So I copied it! That is such a great thing about Stampin' Up! they encourage you to copy what others are doing so you don't have to create new things yourself all of the time. It make smy job so much easier! This card was also based on a card that another demo created. Her name is Andrea Walford. I loved it when I saw it on her blog. I changed it up a little bit, but basically it is her design. This is a Pink Pirouette card. I stamped the hearts in Riding Hood red. For the main image, I stamped it in Basic Brown and colored in the "L" and "V" with a blender pen. 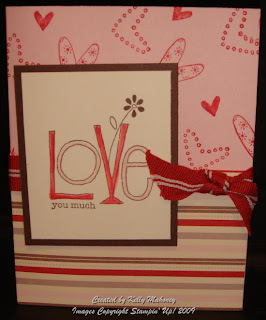 This Creative Challenge was to use a card in the Sale-a-Bration catalog for the layout. The card was on page 9. It is the Birthday card shown here. We were able to use any colors or stamps we wanted to, but just had to use the layout or sketch of this card. Here is the card that I came up with. I started with a Rose Red card. I added a strip of Raspberry Tart DSP on the right edge. Next, I punched a Whisper White strip with the eyelet edge punch. I layered that with a strip of Pink Pirouette and put these on the right edge slightly covering the Raspberry tart strip. I placed another piece of Raspberry tart dsp on the bottom of the card and layered a small piece of Rose Red CS on top of that. Finally, I stamped the large Flower from Fifth Ave Floral on Whisper White CS in Rose Red ink and watercolored it. I cut this piece out and curled the edges a little bit. 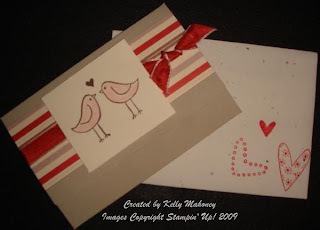 I stamped the "Love you" in Kiwi kiss ink and cut that out, then added both pieces to the card. Give this challenge a try! 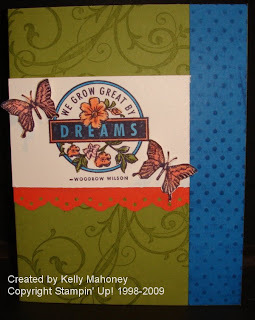 The Idea book and Catalog and the mini catalogs are filled with so many great ideas for card layouts. This is why we call them Idea Books!!! Use those ideas. If you try this challenge, e-mail me your creations or post the link for your blog post or splitcoast gallery to the comments here. I will post any that are e-mailed to me. Ok.... well with Valentine's day being right around the corner, this week's color challenge is to use Riding Hood Red and Pink Pirouette. So, Since I am not feeling so great... I wanted to keep it simple! Here is my cute little creation! This card is 4x4" made out of Pink Pirouette CS. I added a 3 3/4" square of Candy Lane dsp to the front. Next, I cut a strip 3 7/8" long of Pink PIrouette and wrapped it with riding hood red ribbon. Finally, I stamped the heart in White craft ink and embossed it with white EP. I punched it out with the large heart punch and applied it to the card with Dimensionals. That was it. Cute and simple! 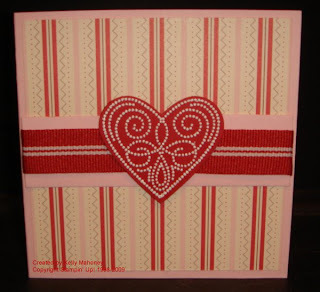 By the way, this heart stamp comes from the Sale-a-Bration set called Polka Dot Punches. You can get this set for FREE with a $50 purchase from now through March 31st. Contact me to place your order! Last week's color challenge was Pretty in Pink, Rose Red, and Close to Cocoa. I needed to make little Valentine's for my mom to give to her teachers, so I thought, let's combine the two! Here is what I came up with! For the box, I used the pillow box die from the Big Shot. Next, I ran the cut out boxes through the Big Shot again using the Texture plates. (this is a little hard to see in the photo) Finally, I assembled the box. I punched out scallop circles form close to coca CS. 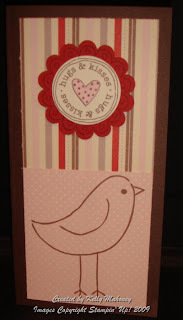 Next, I stamped the Hugs and Kisses stamp on Vanilla CS in Basic Brown ink. I colored the hearts with markers. For the Rose red boxes, I colored the hearts witht he Pretty in Pink marker and for the Pretty in pInk boxes I used the Rose red marker. These boxes were then filled with 2 Hershey's Miniatures. Stop by tomorrow for this week's Color Challenge! Don't forget to check out the blogs of the other Color Girls. You can find the links on the right hand sidebar.